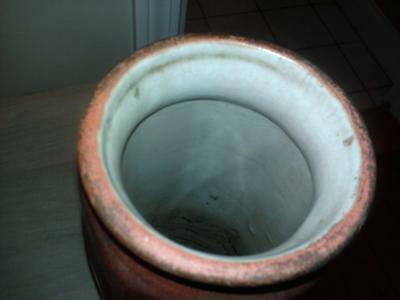 This unusual rust colored vase has sat on the floor, next to the door of my sisters entryway, for about 30 years. I inquired about how she had come to own it. She couldn’t remember, but added that she had owned the vase for at least fifty years. My sister was a collector of mostly early American furniture and art, and searched antique shops for for many years. She had great taste and a good eye. When she asked me if I wanted it, I said yes, but I had never even really taken a good look at it in all the time it sat there. The rust colored vase stands about 12 inches tall and 3 inches wide at the top. The finish is a very rusty color and it is very rough on the exterior. There is a complete painting of what appears to be a chinese or Japanese scene of a few primitive homes with weeping trees, perhaps weeping willows. The scene is painted mostly with green, blues, orange, and yellows. The interior of the vase is shiny eggshell color with crackling. It’s possible this may be because of its age. I don’t know. The bottom is shiny eggshell as well, with a hint of orange. 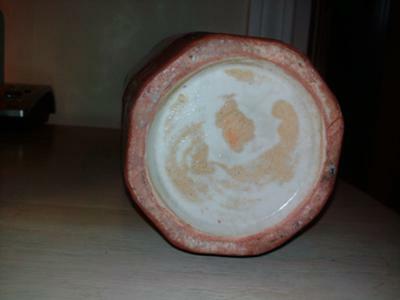 It almost appears that the glaze at the bottom was applied in a sloppy fashion, with a circular, rather messy application of beige glaze over the orange, rusty glaze. 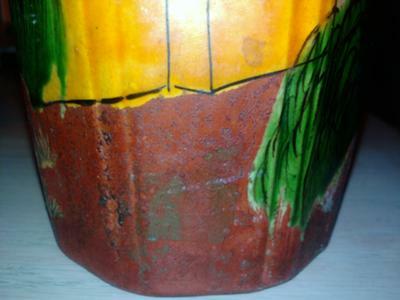 I can’t see any particular mark or brand on it, except for a ‘n or h’ that appears to have been handpainted in gold paint towards the bottom right of the vase. It could just be part of the decoration. I’m not sure on this one either. If anyone has any ideas as to the origin or value of this unusual rust colored vase, please let me know. I would appreciate it. I have looked very closely at the rim, and since it is so intensely crackled, it’s a little difficult to ascertain exactly what letters appear here, even with a magnifying glass. It looks to begin with an H,u,r,r,n., but its possible that other letters precede it, and that could be a W or a Y. Perhaps a professional with a trained eye would see it right away. More curious though, was the very, tiny amoeba scrolled in red at the bottom of the vase. This appears to have been an intentional mark, but again, I haven’t a clue. 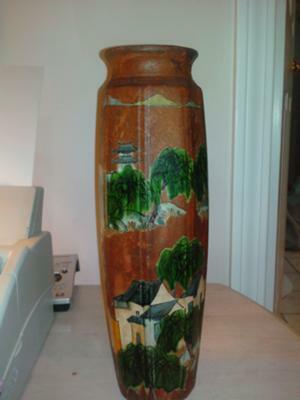 Do you have any information about this vase at all? If you look very closely at the openings Rim, you will see some lettering. I cannot make it out from the pic that you loaded, but you should be able to in person. Hope this helps. Let us know what you find.